Google Sandbox is an imaginary area where new and less authoritative sites are kept for a specified time period in order to prevent search engine spam. It is like a testing space where new sites are retained until they prove their authority and relevance to get listed on the search engines. A new site with less authority and trust might get out of the search engine results (Sandboxed) for a few months or year if it tries to build too many backlinks within a short period of time. In most of the cases, newer sites get sandboxed if they follow a poor seo strategy. Hence, it is always recommended not to buy bulk backlinks or create bulk backlinks with the help of any link building software. Doing so might get your website out of the search engine results for an unspecified period of time. How to get out of Sandbox? You can get out of sandbox by building quality, relevant and user friendly content. Google always make changes to its algorithm keeping in mind the user. Hence, if you are building good content for the user which answers his queries and persuades him to share your content with his/her friends then Google would quickly take you out of the Sandbox. In contrary to what happens to new websites with the application of Sandbox effect, there is another effect known as “Reverse Sandbox”. This effect temporarily raises the rankings of new websites because of fresh content and fresh backlinks. Every new domain registered and every new website created is being cached and indexed by the Google bots as soon as they find a link to it. But many webmasters make the biggest mistake of building massive links to their website in as little as 24 hours after they had launched their website. This is where the ghost of Sandbox wakes up and catches your site. It then puts it into that imaginary area as long as you do not prove that your website is legitimate and provides user friendly, quality content. On the other hand, if you start a new website having original and informative content and bookmark it popular socialmedia sites like Facebook, Twitter, Myspace etc, without building massive links to your website. The algorithm assumes that your website is new , has fresh content, has new backlinks so its ranks your site or web page higher up in the rankings for an unspecified temporary period. The point to note is that whenever you launch a new site, DO NOT start building backlinks almost instantly. Link building is a practice that goes slowly and gradually. You can use popular bookmarking sites for promotion and spreading the word about your newly launched site. So, be careful before your buy those 24 hour link building package for your newly launched site. Please note:- It all started in March 2004 when Google started to penalize new domains doing aggressive link building but still the existence of this so called sandbox is of much debate. There is no proof whatsoever that it does exists! 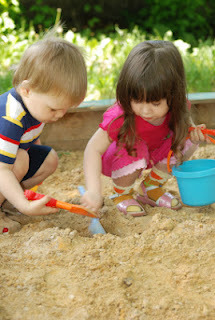 Some believe it to exist while others say- there is no such thing as a sandbox.